With Youth 2030, The Youth Cafe supports the UN to become a leader in working with young people: in understanding their needs, in helping to put their ideas into action, in ensuring their views inform our processes. The Strategy is aimed at guiding the entire United Nations (UN) system to empower young people to realize their full potential and to stand up for their rights. It also aims to ensure youth engagement and participation in the implementation, review, and follow-up of the 2030 Agenda for Sustainable Development, as well as other relevant global agendas and frameworks. the human rights of every young person are realized; that ensures every young person is empowered to achieve their full potential; and that recognizes young people’s agency, resilience and their positive contributions as agents of change. Young people today want the sustainable, peaceful world envisioned in the 2030 Agenda for Sustainable Development. Realizing their aspirations depends on realizing their rights — to empowerment and development, participation and choice. They offer 1.8 billion reasons for the United Nations to stand by their side. 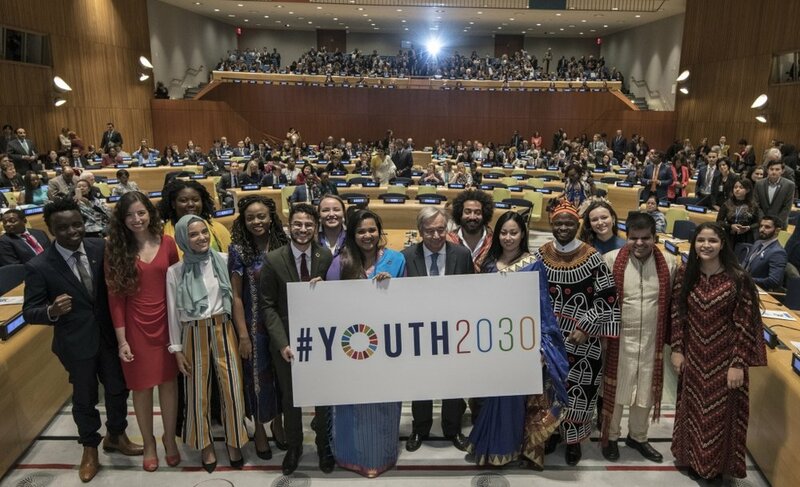 The official launch of Youth2030: The United Nations Youth Strategy, took on Monday, 24th September 2018 at a High-Level Event at the United Nations in New York. The Strategy was presented by the UN Secretary-General António Guterres.